It was a crazy morning! I arrived at the Hobby airport. But I did not expect the extremely long line to check in a bag and security. I missed my flight. Bummer. So at the kiosk, they booked me on another flight that would go to New Orleans, then to Chicago, then to Columbus. I don't wanna fly Southwest again. I'm now here with Mike at Thurman Café. I'm gonna have a Pepperoni Piza Burger. Yummm! Havefun while in Ohio. The bars in Columbus have changed so much There is only like a couple that I remember. The best food and music is on High Street across from the OSU campus. I think Singing Dog Records is still there! Eat some White Castles for me. I miss them compared to Krystals! Also know Worthington is my hood where I grew up! We did pass by Singing Dog Records. My partner likes going there. I have some pics to make you nostalgic hehehe. If you're into Big Boys restaurant. OH is one of the few states that still have them. 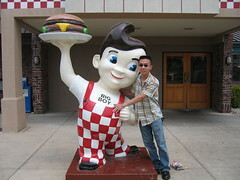 Don't forget to take a photo with the Big Boys statue. I guess I missed this one. I would definitely have taken a pic if I saw one.